There are many ways to use a bicycle. This blog is mostly about exploration, and illuminating the many pleasures of cycling in and around the Catskills. As such, I imagine that many readers place a high value on the ways a bicycle is a vehicle for exploration and self-sufficiency. It’s not about getting from point to point as quickly as possible; it’s about the path in between. Randonneurs don’t care about who gets there fastest, but they respect those who experience the best journey. On the other hand… at a recent local event, I struck up a conversation with a guy wearing a shirt silkscreened with a stylized track bike. He turned out to be a lifestyle advocate for cycling as functional transportation. He didn’t own a car (David Byrne style). For him, bicycles are literally about getting from point to point — not about the speed, or the journey, but the simple fact of moving people and goods with no dependency on energy infrastructure. (I guess they didn’t have a shirt with a stylized cargo bike at the store.) While I certainly support his cause, he was a somewhat overzealous advocate. He was scornful of both recreational cyclists and racers, because he felt that they create a public perception of cycling as a leisure-class or athletic-niche activity. 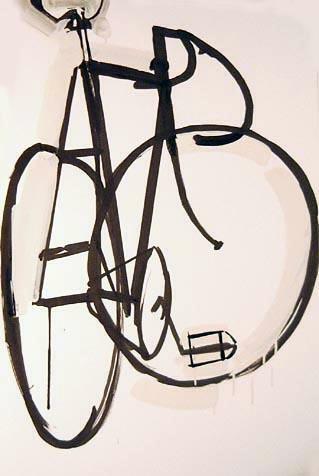 All of which is to say, bicycles mean many things to many people. It’s human nature to self-select according to our interests, and it’s easy to caricature those whose interests don’t mesh with our own. Sheldon Brown, socks and SPD sandals, leather saddles. Lumberjack beards, skinny pants and brakeless fixed gear bikes. Garish lycra, shaved legs, and uncomfortable carbon frames. Essentially, this is a big pre-apologia for posting a bike race report on Riding the Catskills. Racers are a small subset of bicycle enthusiasts, and a particularly easy subset to make fun of. Bicycle racing is contrived, narrow, and highly specialized. And it attracts people with obsessive tendencies. Most people have no idea how hard you have to work to be a mediocre bike racer! But I do it anyway. Racing offers a completely different set of rewards from the other ways to use a bicycle. Like jumping out of an airplane, racing is a heightened experience. Success requires maintaining absolute focus on the moment, while another part of your brain constructs situational and tactical awareness, all while your body is trying to concentrate all of its energy into physical output. In my view, the measure of a successful race is not winning, it’s maintaining that heightened state for as long as possible. The desire to achieve that state creates a strong compulsion. 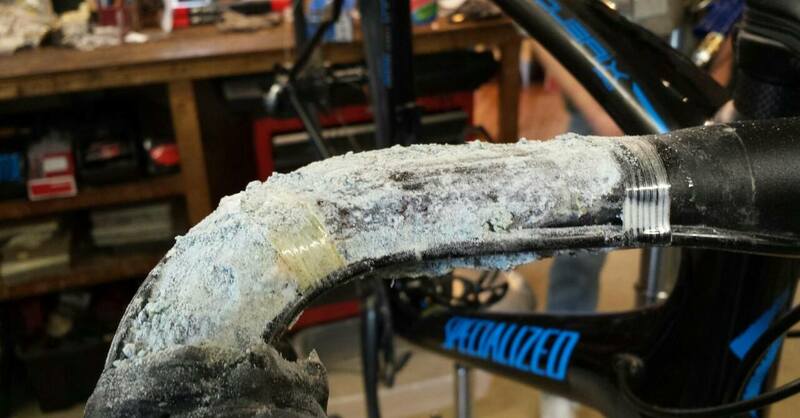 My buddy Jim rode his stationary indoor trainer so long this winter that his sweat literally ruined his aluminum handlebars. If you’ve ever ridden a trainer for even 20 minutes, you may have some inkling of how unnatural this is. For me, the compulsion manifests in winter riding that seems almost masochistic to outsiders. I’ve reported here on hundred-mile rides on a heavy singlespeed, icy roads and sand-covered descents. I haven’t reported on interval training and hill repeats, which are far more boring and can’t be prettied up and passed off as an appealing way to experience the Catskills. The spring race season in upstate New York started last weekend, with the first race of the 3-week Trooper Brinkerhoff series in Coxsackie, in Greene County. The Trooper series (formerly known as the Johnny Cake Lane series) is a fast, rolling, very windy road race. 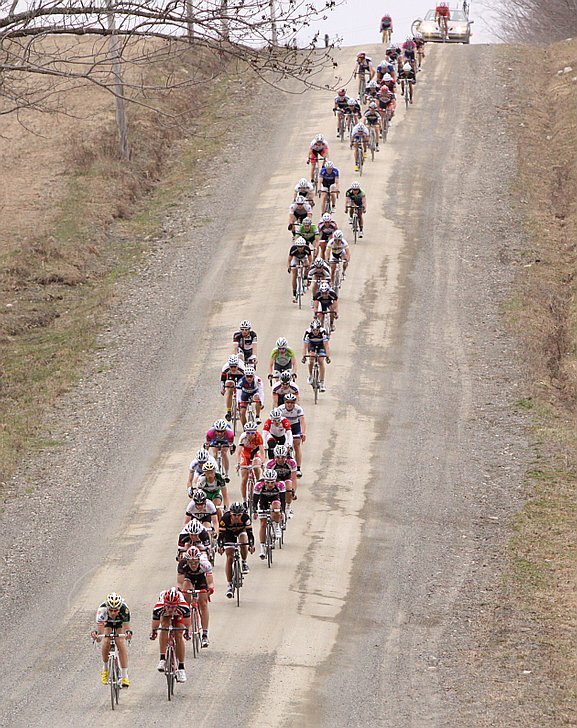 The weekend after the Trooper series is Battenkill, one of the biggest races in the country. This is a brutalizing route through gorgeous, hilly dairyland in New York’s Taconic Valley, not far from Bennington, Vermont. Battenkill is modeled on the cobbled Spring Classic races of Belgium, and features long sections of pitted dirt roads and sharp climbs. It’s a spectacle, too: thousands of racers invade the tiny town of Cambridge, New York, literally doubling the population for the weekend. The local spring races conclude with the Hunter Mountain Spring Classic, a relatively new, hilly road race right in the middle of the Catskills. I’ll be doing all of these races over the next two months, sprained knee willing. I probably won’t report on all of them, because I don’t want to bore everyone to death with race report navel-gazing. But I will report if anything interesting happens. Like last weekend, when I won the Trooper race. Shortest race report ever: a field of 65 category 4/5 racers. A few breakaways tried to get away but fizzled in the wind. 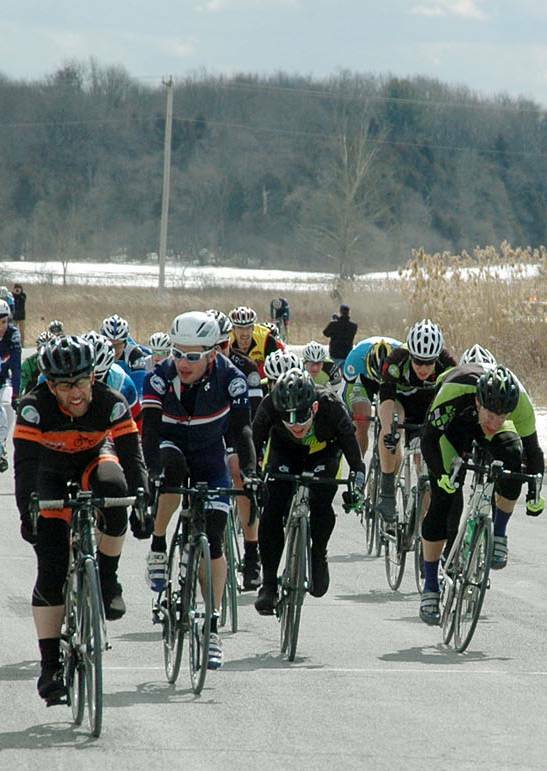 A pack of about 40 racers at the front was psyching itself up for a bunch sprint. At the 1k sign I took off from about 10 racers deep and never looked back. The surprise kilo attack worked, I got a gap, railed the final corner, and won the race by about a bike length over the chasing pack. That’s me, on the left, looking happy. My goal for the spring races is to get the last few points for my cat 3 upgrade, then race open masters fields exclusively. Masters fields are very skilled and fast, so I will never again get another podium or upgrade point, but the quality of racing is high, and after all, it’s all about the journey, not the result. This entry was posted in bicycle racing, bicycles, race reports on March 19, 2014 by John Schwartz.